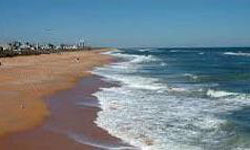 Flagler Beach combines the beauty of the Florida coastline with a quaint, small town atmosphere. The permanent population of Flagler Beach is only 5400, but many visitors flock to this quiet little town to enjoy its’ pristine beaches and numerous other attractions. Located 68 miles south of Jacksonville between St. Augustine and Daytona Beach, Flagler Beach is a narrow island bordered on the east by the Atlantic Ocean and on the west by the Intracoastal Waterway. It’s less than 10 minutes off I-95 and only 15 miles to popular Daytona Beach. Incorporated in 1925, Flagler Beach was, at that time, no more than a sleepy little fishing village. It has since grown into a unique seaside community with lots of amenities to offer visitors, yet it has retained much of its’ original charm. The first settlement here was named Ocean City and was located on the west bank of the inland waterway, and the first home was built in 1913. Soon after that a general store and post office was constructed. The United States Post Office gave the town its’ official name of “Flagler Beach” in 1923. Over the years, it began attracting more and more retirees, but soon families and businesses began to relocate here as well. Today, Flagler Beach is fast becoming one of the “hot” destinations in Florida and is part of the growing Palm Coast Area, a twenty-mile stretch of scenic coastline that is a sportsman’s haven. Visitors, as well as those looking to relocate, are discovering the area’s advantages; close proximity to resort and culture centers, tranquil waterways, subtropical forests and freshwater lakes, first class golf and amenities, yet far removed from the stress and fast pace of other, larger cities. Flagler Beach offers over six miles of serene, uncrowded beaches, along with a wide variety of outdoor recreational opportunities. 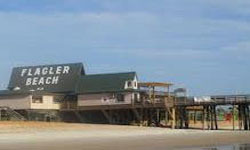 The Flagler Beach Boardwalk and Pier are located downtown and is the center of many community activities. You can fish off the pier; watch the surfers catch a wave or just relax as you take in the natural surroundings. There are also picnic shelters located along the boardwalk. The Intracoastal Waterway flows through town and provides other countless opportunities for fishing and boating. During May to the end of October, Flagler Beach is a protected sea turtle nesting area, and the Flagler Beach Ocean Rescue is on duty all year to guard the beach. This old-fashioned town has only 3 traffic lights and a traditional town square. You can easily walk to everything. There are casual “beachside” restaurants, outdoor cafes and pubs, gift shops and shops that sell beachwear and surfwear, along with convenience stores, supermarkets and other services. Car rentals are available, and Flagler County has an airport that is suitable for small or corporate jets and is in the stages of growth to accommodate larger aircraft. The Daytona International Airport is within 30 minutes of Flagler Beach and the Jacksonville International Airport is approximately 75 miles north. Orlando’s airport is 86 miles southwest and all three can be easily reached via I-95, which is just minutes from town.